At Jaco Aerospace, we are conscious of the impact we have on our planet and we are proud to offer high quality chemical repackaging services to our customers. Chemical repackaging helps the environment, while helping you buy the amount of product you need, thus saving you costly disposal fees. Jaco Aerospace offers customized solutions to meet your specific requirements while providing lightning-speed turnaround times for all of your packaging needs. 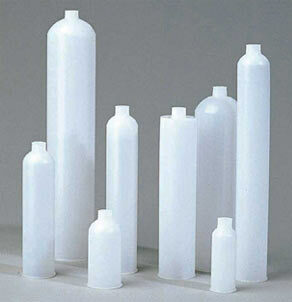 Often the product you need is available only in large sizes such as five-gallon or 55-gallon containers or totes. Instead of buying excess product and repacking the material yourself, Jaco Aerospace can help you by repacking large quantities into smaller, more convenient sizes. We consider the shelf life of sensitive items, premature hardening of sealants, paint drying out – any possible conditions that could affect the product. One and two component systems for items such as adhesives, encapsulants, sealants, coatings, greases, lubricants, cleaners, primers and a variety of other specialty chemicals. Packaging Options such as dual syringes, Techkits, tubes, pouches and aluminum tubes. Jaco Aerospace can repackage your products into any size you may require, from 2.5 oz plastic cartridges to a five-gallon plastic bottle. Extensive labeling capabilities, including customized labels for your materials. Pre-Mixed and Frozen repacking capabilities. Jaco Aerospace is also equipped to repackage a variety of chemical systems, from premixed and frozen plural component resins to silicone fluids, oils and emulsions. Viscosity, color, cure time, and performance enhancing modifications as well as blending of customer’s formulas are available in many batch sizes and almost any type of packaging. We are able to modify all sizes, from quarts to drums. Jaco Aerospace partners with you to recommend the best packaging solution, based upon your chemical and application needs. We are continuously expanding our capabilities. Please contact us to speak with a representative about how we can help you with your repackaging needs.